Siberian Eleuthero root is naturally extracted using only the finest quality eleutherococcus senticosus root bark. Our Standardized True Spectrum extact provides active levels of eleutherosides B & E, concentrated in the balance ratio nature intended, without isolating, fractionizing or using toxic solvents, harsh chemicals or gases. Eleuthero root supports the body's ability to adapt to stree while enhancing long-term energy, vitality and well-being. It has been used for centuries to increase stamina and maintain optimum performance and health. Warning: keep in cool dry place, out of the reach of children. This product is not intended to be used by pregnant or nursing women. 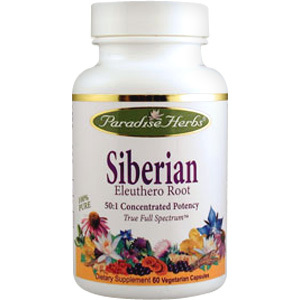 What is SIBERIAN ELEUTHERO ROOT? Siberian Eluethero root is also known as Ciwuji. The shrub growns 3 to 10 feet high and is covered with thorns. The wrinkled and twisted root contains a mixture of compounds; one group called eleutherosides has been shown to be primarily responsible for its adaptogenic activity. The main and most active of these eleutherosides are B and E. Among the other ingredients are polysaccharides which have been shown to display immune modulating activity. For centuries the Chinese have prized Siberian Eleuthero root to prolong life, enhance health and stimulate both a healthy appetite and a good memory. Siberian Eleuthero root may be used on a daily basis to support both men and women. Unlike some ginsengs that are too strong to be taken without harmonizing herbs, Siberian Eleuthero root can be taken long term without interrupting the sensitive balance of the body's resistance to stress. When stress levels are high, the body's systems become imbalanced. Symptoms of this imbalance may be fatigue, insomnia, depression, anxiety, irritability, lowered resistance, muscle fatigue and aches, depleted energy and lack of sexual drive and reduced mental and physical performance. Studies have established that it acts as an adaptogen and helps people handle stressful conditions as well as excel in athletic and mental activities. It has been shown to increase energy and stamina and helps the body resist viral infections and environmental toxins. It has also been shown to be beneficial in reducing the side effects associated with radiation and chemotherapy. Siberian Eleuthero Root - is shipped in a discrete, unmarked package. Orders are processed immediately and usually take about 3 to 5 working days to be received. We do ask that you try it for 2 to 3 weeks to feel the full effects. Any information received is used only for order processing and shipping purposes. Your information, such as e-mail address, will never be disclosed to a third party.